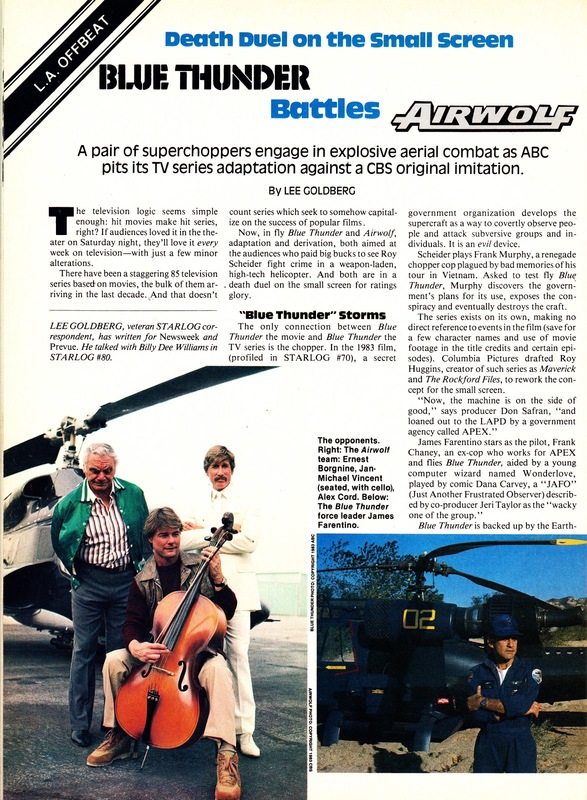 Both these shows were launched in January 1984, and both were obviously inspired by the big-screen success of the BLUE THUNDER movie. The TV incarnation of the Thunder was a lacklustre affair, hampered by a bloated cast (including two ex-professional footballers seemingly shoe-horned into the format to satisfy some network contractual obligation), a succession of underwhelming scripts and a sneaking suspicion that the primary motivation was to maximise the studio's investment in the helicopter. Plus points, however, did include James Farentino, Dana Carvey (really) and genre-favourite Richard Lynch as the improbably-named villain P.V.C (really!) in the extended-length opener. AIRWOLF, on the other hand, was much smarter fare. 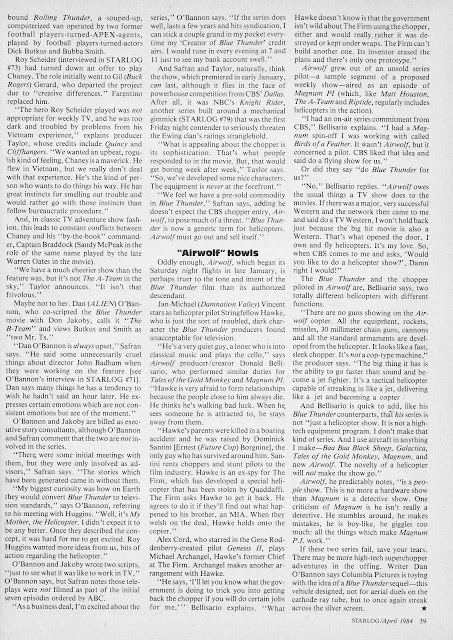 Donald P. Bellisario, already a producer-with-credability thanks to BATTLESTAR GALACTICA, MAGNUM P.I and TALES OF THE GOLD MONKEY, assembled a far more ambitious show, pitching the 'wolf against various internal and external threats. Plus: the helicopter was MUCH cooler than the Thunder! Both debuted as mid-season replacements but only AIRWOLF booked a return flight on the Fall 1984 schedule. The network, unhappy with the show's soft numbers, ordered the show reworked so that Airwolf tackled more domestic threats and human-interest story lines. The 'wolf eventually clocked-up three seasons before succumbing to its ratings woes (and behind-the-scenes bust-ups between the show-runners and wayward star Jan Michael-Vincent). 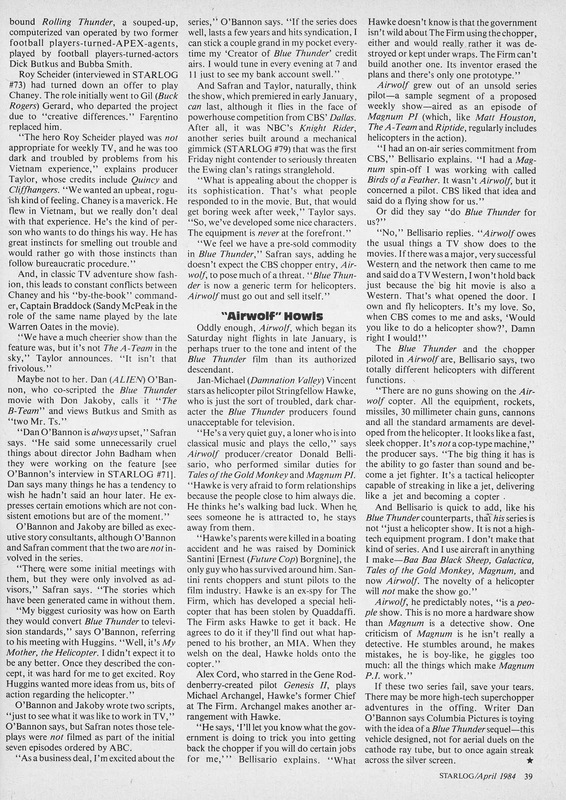 Universal needed another season's worth of episodes for a healthy afterlife in syndication so subsidiary USA NETWORK bankrolled another 22 episodes (occasionally known as AIRWOLF II). These final episodes, with a new (cheaper) cast (hello Barry Van Dyke!) were shot on a shoestring budget (and edited on video, enhancing the low-budget aesthetics) in Canada. 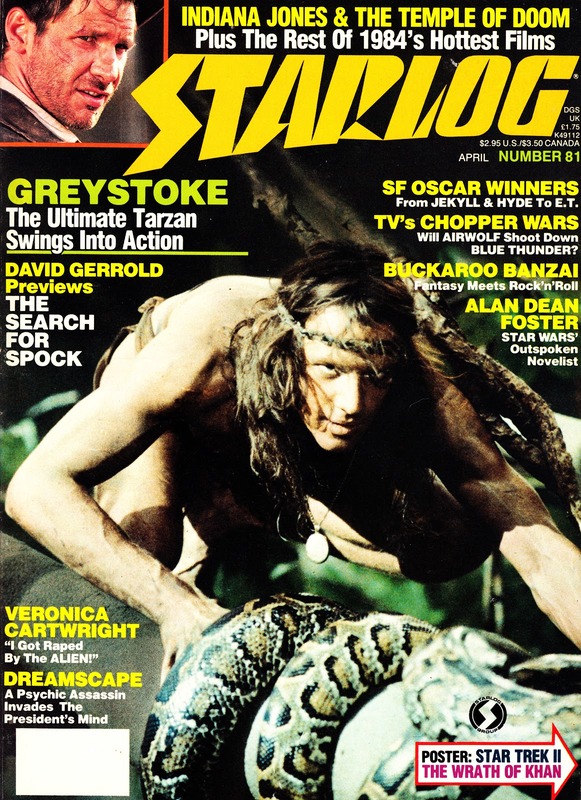 This article appeared in STARLOG MAGAZINE issue 81, cover-dated April 1984.